Is it Okay to Eat Eggs Every Day When Pregnant? Pregnancy nutrition focuses on eating healthy, which means choosing foods from all food groups and eating the right number of calories daily. Eating eggs every day can have some benefits during pregnancy, but there may also be risks associated with eating the same thing repeatedly. Discuss the specifics of your pregnancy diet with a health care professional to receive advice about your situation. 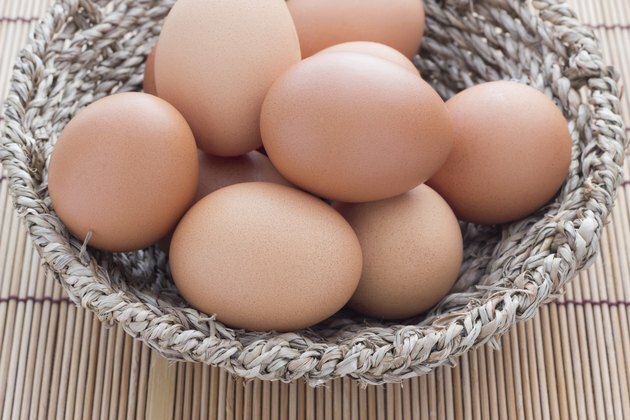 A whole egg has about 6.3 grams of protein, according to the Incredible Edible Egg organization. During pregnancy, women should consume between 90 and 110 grams of protein daily, states certified nurse midwife Dana Ericson of Midwife and Doula Services. Protein is essential for building up the placenta and the unborn baby's tissues. Eating one or two eggs every day — for example, during breakfast or atop a salad — can help meet this protein requirement. An egg is not very high in calories, considering how many important nutrients are found inside. Calcium, vitamin A, vitamin D, iron and potassium are just some of the beneficial nutrients and minerals found in each egg. Pregnant women should eat between 200 and 300 additional calories daily to nourish the body and the baby. Eggs contain about 70 calories each, making them a good snack or addition to any meal. Choline promotes brain development and memory function early in an infant's life if the mother consumes it during pregnancy, according to the Choline Info organization. Eggs, beef liver and chicken liver are among the highest choline sources. Eating two eggs can provide almost half of the daily recommended amount of choline — making them a healthy food choice throughout pregnancy. An egg's yolk contains 185 milligrams of cholesterol, according to the Incredible Egg organization. In a day, an adult should consume fewer than 300 milligrams of cholesterol. Eating two eggs each day would put a pregnant woman over the recommended amount of cholesterol; this does not take into account any of the other cholesterol-containing foods she has eaten. Depending on the rest of a pregnant woman's diet, eating one or two eggs most days of the week may not be harmful. A woman who is overweight or struggling with high cholesterol during pregnancy could increase her risk of complications by eating eggs every day. The National Institutes of Health recommends limiting egg yolks to three or four per week. For a low-cholesterol option, you can use egg whites. Consult with a health care professional about whether eating eggs each day would create unnecessary risks to your pregnancy. It is never advisable to consume raw or partially cooked eggs because of the risk of salmonella infection. This includes all versions of raw or semi-raw eggs, homemade mayonnaise, eggnog and any similar foods. Salmonella infection can't be transferred to the baby during pregnancy, but the side effects can cause preterm labor, unnecessary uterine contractions that can stress the baby or dehydration from persistent diarrhea or vomiting. Handling raw eggs can elevate the risk of infection and should be dealt with by thoroughly washing surfaces and hands that encounter the egg.